No one told Hal and Melanie Young what to expect when their little ones were no longer little – so after they got over the shock – they wanted to share some of the things they learned by writing the book No Longer Little: Parenting Tweens with Grace and Hope. This book is published by Great Waters Press and shares their lessons learned through parenting preteens – understanding what was happening, when to expect it, and how to navigate through it. Everyone knows about the changes of adolescence, but all that hormonal activity began long before external changes. Puberty is the process of physical change in the transition from childhood to adulthood. It’s no wonder the preteen years are hormonal – moody, irritable, unpredictable in their personalities – both sexes have hormonal surges exceeding fifty times the normal, stable levels they have in adulthood. Irrational outburst can certainly test our parental patience. The seems to take advantage of this emotional turmoil to tempt our children away from our care and guidance. That makes this stage of parenting one of the most critical. More importantly, God’s Word reaches their hearts better than our words. Hormones not only effect their body and emotions; but also effect their brain. During puberty, the part of the brain changing the most is the area that controls executive functions. These are tasks like problem solving, priority setting, short term memory, attention, and focus. Neurologist say these parts of the brain actually unravel; there truly is a temporary loss of function as the neurons re-assemble into their adult configurations. So, how do you cope? Prayer and patience. It’s hard to hear the child you’ve prayed for, the child you’ve taken to church week after week, now questioning the most important truths in life. I have been here – we would search the Scriptures together – we would sometimes reach out to our pastor for advice – but we had to understand what our daughter was thinking and feeling. Hormones also effect their sexuality. God created our sexual nature and the act itself with a specific purpose and blessing – “to be fruitful and multiply.” Our challenge is to protect our children from the misuse of sexuality and from sin, while preparing them for marriage. Teaching preteens about sexuality and preparing them to fight temptation is about an ongoing series of conversations from childhood to adulthood. It may be uncomfortable, but we need to establish a Biblical understand that sexuality is create by God and designed to be used only in marriage. Hal and Melanie Young not only share the effects of hormones throughout these preteen years; but they share words of wisdom regarding money, work, stewardship, social struggles, bullying, and social media. Preparing our children for their digitized future involves training them to use devices and media with wisdom and discernment. 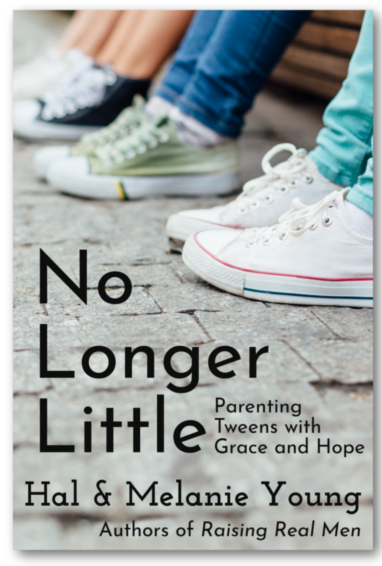 Visit the Crew Blog to read what the Homeschool Review Crew has to say about No Longer Little: Parenting Tweens with Grace and Hope. Thank you for offering the Bonus Pack!